I have shared with you a few different potato soup recipes here on the blog. I make many variations like, my Ultimate Loaded Baked Potato Soup, my Sweet Corn, Potato and Sausage Soup with Kale and my Ham and Potato Chowder with Homemade Croutons. And, even though I really have never met a potato soup that I didn't like, there are some that I favor and seem to make time and time again. This recipe is one such recipe. 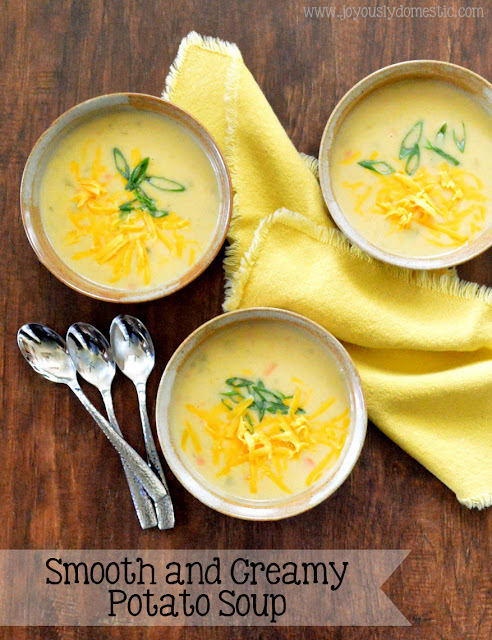 I first began making this soup after seeing a version of it made by Ree Drummond. The smooth, blended aspect of her recipe appealed to me. I think so many of us are used to thick, chunky versions of potato soup. This recipe is just a tad bit different and one that I fell in love with after my first spoonful. It, for some reason, feels lighter than typical potato soup (even though it is finished with cream) and it's a soup that doesn't feel heavy even when eaten during these warmer spring/summer months. It feels almost velvety on the tongue and is just so dang luxurious-tasting. This recipe is an uncomplicated one, but one that is built upon layers of flavor. Onions, carrots and celery are the vegetable combo that is the soup's foundation. Once diced potatoes are added and simmered in chicken stock, the soup is thickened a bit with a flour and milk mixture. Then, the soup is blended to the smoothness of your preference (I like mine mostly silky-smooth with just a few tiny bits of vegetables remaining). The whole thing is finished with cream and served with the garnishments of your choice. Note that this soup reheats wonderfully and in my opinion, is even better the next day. Preheat oil in large Dutch oven or soup pot over medium heat. Add onions, celery and carrots to oil. Cook until slightly tender while stirring occasionally. Do not allow to brown. Add potatoes, salt and pepper. Stir. Pour in stock. Bring to a simmer. Cook 10 - 15 minutes or until potatoes are cooked through. Meanwhile, whisk together flour and milk in a small bowl until smooth. Stir into soup mixture. Cook soup for another 5 - 10 minutes while stirring occasionally. Once blended, stir in heavy cream starting with 1/2 cup, then adding more as desired. Ladle soup into individual bowls. Garnish with scallions and cheese. NOTE: Crisp, crumbled bacon can be served atop soup at time of service, if desired. Also, soup can be made vegetarian by utilizing vegetable stock in place of chicken stock. I love the idea of adding carrots, which I don't, to potato soup. I thicken my soup with instant potato flakes. LOVE this recipe. It's quick, easy and tastes awesome. Love that it doesn't use flour as a thickener. I do add sharp cheddar cheese to it when it's done. I let it melt, then stir it up. This is a keeper for sure.